He knows how to use public posts to check and balance the money power. 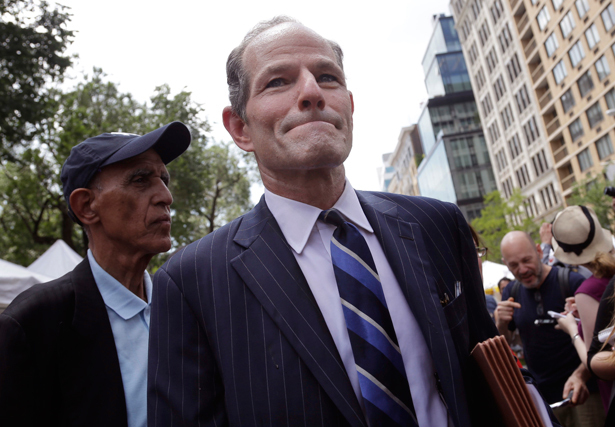 But Spitzer’s dismissal of public financing of campaigns makes for an unsettling comeback. Eliot Spitzer is a walking, talking political contradiction. As the crusading New York State Attorney General during the Bush-Cheney years, he filled the regulatory void created by the most business-friendly administration in modern American history and renewed our understanding of the power of state officials to check and balance Wall Street. Then, as New York’s governor, he crashed and burned his own career—and an opportunity to redefine states as the liberal “laboratories of democracy” that they were in the Progressive Era. But prostitution, adultery and Twitter scandals don’t end political careers anymore. Just ask Louisiana Senator David Vitter, South Carolina Congressman Mark Sanford or New York mayoral candidate Anthony Weiner. So Spitzer is back—just as brilliant, and just as arrogant, as ever. First the smart part: the former governor’s decision to make a last-minute leap into the race for New York City Comptroller is a savvy political move. It’s the right race: A comeback bid by a political figure who has been involved in so high-profile a scandal as Spitzer’s needs to start in the right place on the ballot. A run for governor or mayor would have demanded more forgiveness than voters were prepared to extend. Spitzer needed to find a post that was prominent, but not too prominent. Seeking a city-wide post in New York is a comedown from the state posts Spitzer held. But the comptroller’s office is an important post in itself and it has produced mayoral candidates and mayors, statewide officials and members of Congress. It’s the right year: everything is up for grabs in New York this year, and everyone’s running for something. There are crowded races up and down the city ballot. Spitzer will get his share of attention—the New York Post headline Monday: “Here We Ho Again”—but there’s so much else going on that the attention is more likely to help than hurt. Because he’s running for a down-ballot job, he brings “star power” to a race that would otherwise get limited attention. His existing name recognition, in combination with the wealthy Spitzer’s ability to spend what it takes to shape the race, counts for a lot in this sort of contest. Unfortunately, it is on the question of campaign funding that Spitzer’s arrogance—and irresponsibility—are very much on display. Spitzer’s most prominent foe in the Democratic primary for comptroller is Manhattan Borough President Scott Stringer, an able and well-regarded progressive with substantial union support. Stringer’s campaign hit Spitzer immediately for opting out of New York City’s public-financing scheme for municipal election campaigns. “Eliot Spitzer is going to spurn the campaign finance program to try and buy personal redemption with his family fortune,” griped the Stringer camp. The problem, of course, is that not everyone is able to buy their way into a race at the last minute. Spitzer’s dismissal of New York’s system of providing matching funds for candidates with the worst-of-all “your money” versus “my own money” rhetoric is not just arrogant. It’s wrong. Spitzer has a broad vision of the comptroller’s office—a vision that could have national significance when it comes to using state and local pension funds to establish what he refers to as “structural” checks and balances on corporate America, and when it comes to conducting “policy audits” to determine whether public programs are delivering for Americans. Those audits will, invariably, reveal that the flooding of our politics with private money plays a huge role in warping the workings of government. What the progressives of another time referred to as “the money power” is toxic, and the toxicity infects government at every level. Even those who support Eliot Spitzer will recognize that he is not the only wealthy contender—or the only contender who might use big money to win a big election. If Spitzer is serious about using the New York City comptroller’s office to audit our public policies—and to propose real fixes—he should not be so arrogant as to casually dismiss attempts to address and constrain the money power. While Eliot Spitzer is bringing attention to the comptroller race, the race for mayor has long been in the media, thanks in large part to stop-and-frisk’s undecided and controversial future.